August 12, 2017, marks the second anniversary of Brenda’s passing. Two years and we still have days when we feel like we cannot participate in life. Yet the family are in this together (Phil. 1:30). We know it will not always hurt this much but even after two years it still seems so fresh as this woman loved and is loved, so deeply. We are choosing to move through this together. That’s how we roll in the Pue family. We have established traditions around the anniversary date that we will maintain. It starts with all of Brenda’s boys – sons, grandsons (and Ellie) – attending the airshow. Why? It’s hard to explain, but when Brenda was in her final days she insisted that her boys go to the airshow, something we have enjoyed together many times. It was important to her. I wondered if she just wanted time alone with Kristin (our first daughter in law), or maybe was just desiring some quiet time. We were at a stage where someone had to be with her at all times and Kris gladly stayed with ‘Mom’ while we all packed into the car and went off to enjoy something that in some ways took our minds off what was taking place at home. So part of our memories and thoughts about how intentional and thoughtful Brenda was, we went again and enjoyed the display of flight. This morning we gathered early as a family and go to the cemetery where we hold a private time as family sharing stories of Mom, Grammy and wife amidst tears. Then a reading to refocus us on hope for the future and healing followed by checking in with each other as to how we are doing with our grief. Jon closed as he prayed for us and we then we headed back. It brings some joy to me to see how comfortable the grandkids are at the cemetery. They were an active part in her burial, actually hauling the buckets of dirt and helping the Burial Grounds Custodian tamp down the dirt as it was layered. My oldest grandson Landon dropped a note to Grammy into the burial box, Liam placed a flower in the grave and even my sweet Ellie who was dressed in a cute dress got herself all dirty helping with the dirt. Now when they come they feel comfortable and not afraid or fearful. There is always something planned for the children to participate in our remembrance service as we want them an active part of our day. Today they laid a rose with us on the gravesite and either said something about Grammy or placed a drawing there for her. Dear Ellie found this morning hard. She loves so deeply. When we gather at the house it is time for Grandpa’s (or as Georgia would say “Gwampa’s”) World Famous Pancakes . We placed more roses on the table with us in recognition of Brenda’s absence and we continued to share wonderful stories about Mom and Grammy while we eat as well as appreciating doing this grief journey together. Tomorrow we pack up for a week away at Barnabas, a place illed with memories of Brenda. During Brenda’s illness we held a few family retreats here. It is a “thin place” as the Irish would say. We decided as a family to join together with Barnabas to finish a new bedroom in her memory. So we look forward to seeing how the construction has come along since our last visit. Brenda and I have spent literally months at Barnabas over the years. Training Arrow leaders, ministering to families, hosting retreats and all of our sons have served there over the years. It as without a doubt Brenda’s favourite place on the planet and we wanted to acknowledge this by creating a memory of her there that we will be able to see used for ministry over the years to come. Our week at Barnabas encourages our family value of summer camp and provides at time when we can learn together and just hang out without any other pressures on our busy family. It is not by chance that Dr. Steve Brown (Arrow Leadership) is the speaker for the week we are there and we all enjoy sitting under Steve’s teaching made especially touching in that he and Brenda worked so closely together, he married Jeremy and Shari and has been know to our kids for years. This being the first year at Barnabas with our newest grandson Roland (or Ro as he is already called) will be bitter sweet. Brenda would be all over him but we will gladly take turns caring for him. I am not sure how the descending of the Pue clan onto the island affects others. We will definitely make it a bit noisier with our laughter and sheer number – 13 of us! I want all to realize that sometimes, in order to heal, we must free ourselves from others expectations and also from our own. There are times in a day when we actually feel like laughing and the Pue’s enjoy those times. We see loving laughter as a cathartic gift just as much as our tears. I’m sure we will laugh and cry, but we will do it together. What are we learning about grief so far? There are many things I will share from my perspective in another blog that I will write while at Barnabas. But as a family unit we are realizing it takes time to heal such a loss. We have learned to be gentle on ourselves realizing we all travel at a different pace in processing the loss. We decided early on that we will take as much time as it takes. My friend, Susan Perlman, encouraged us to mourn as it is necessary to heal fully. and a season for every activity under heaven . . . It is a joy for me to watch my children treating each other with care and it is hard to imagine journeying alone through this. All are at different places but at this two year mark we can see how we have come along since last year. The greater your loss, meaning the closer you were to the person who has passed, the more time you are going to need to heal. It is a testimony to Brenda’s relationship to each of us that we need more time. We all think that we were her favourite, but she made everyone think that.As people of faith we can see how God created us with the ability to heal, and we know that healing will happen. It’s happening right now but more on that later. Did you know that 100 Huntley Street is Canada’s longest running TV Talk Show? After decades of serving Canadians it is still a place men and women tune into to hear the stories of real people. With thanks to Lorna Dueck and her team I was invited to share a little about Brenda’s book and our family journey in grief after cancer. Lorna is so easy to talk with I hardly noticed the cameras and lights. She and Brenda were close. In Brenda’s Bible she had a list of some leaders she prayed for each of the seven days in a week and Lorna was one of those leaders. Enter COUPON CODE using 100Huntley and the click UPDATE CART and a 30% discount will appear. At CHECKOUT fill in your billing data and you may safely use your credit card with Arrow’s PayPal system. Arrow will ship your books quickly. Thanks to both Arrow Leadership and 100 Huntley Street for helping to encourage and comfort people during times of great testing. What it was like to work on Brenda’s “But If Not” book – the journal of her 588 days living with cancer? That is a question a few brave friends have gently asked me over the past months. Here is my answer today.. It was hard handling her words, reading her inmost thoughts while facing the ultimate challenge – death. Hard also because I know how the story ends. Hard because I remember those days and they are precious memories for us – days I would never regret. Other pages cause me to laugh out loud. Brenda is very funny at times while recounting her experiences with cancer and openly sharing the feelings she experienced. The sweet story about the Jack Russell terrier that followed us home on a walk, her struggling getting words mixed up, and the funny interactions with her boys and grand kids are hilarious at points. She never really lost her ability to make us smile and laugh. I’m also moved by the friendships that are obvious throughout the book. Brenda has friends literally around the world. Not fleeting friends, or Facebook friends. I’m talking about friends who walk life with you, and most notably her Palm Springs Prayer Group. Readers will glean a great deal about how to be a real friend though Brenda’s story. For me, recounting the first eleven days was difficult. I am so grateful for our family during those days of tests and more tests until the lung cancer diagnosis was given. We were a close family back then, and we are even closer today because of Brenda’s faith and leading us well in this incredible journey. The last section of the book called the epilogue was written by our adult children. That particular section caused many tears on my part as I ‘listened’ to them share their individual perspectives on “Mom”. They sure love her. When we received the first copy of the published book Jason asked me what it was like to hold it. I replied, “Good. It feels good.” We pray that readers will love the insightful, courageous faith filled words of “But If Not” and that these words will encourage others to live life with generous intentionality. Today I am on my sailboat needing some time alone. At sunrise the horizon shone with red hues reminding me of an old mariners phrase. A reddish sky around sunrise means a lot of water vapour already present in the atmosphere and rainy weather is thus expected. This explains why sailors repeat, “Red sky in morning, sailors take warning. Red sky at night, sailors delight”. Well today I changed it to “red sky in mourning” for that is what I am doing. Mourning the absence of my beloved Brenda and being sensitive to my own grief journey. Today, I had set aside in order to complete the edits on Brenda’s book “But If Not: 588 Days of Living with Cancer”. I knew that re-reading her journal of life and death would bring tears again, and it did. It was actually both a time of tears and smiles. I read her words and was reminded of her attitude of gratitude amidst her pain. I read of the moments that brought her great joy while facing death and while they made me smile it served as a bit of a warning to me – or better stated, a reminder. So may this journal of life and death inspire you to not waste a second of your life on things that are not going to last forever. Trust in God for eternity, and leave a legacy through your investment in others that will change the world through God’s love and mercy. In life we will experience disappointments, but it need not lead to discouragement. Trust Him. Trust -is my focus word for this year. But these words also emphasized that we should not to put our time and resources into those things that are not going to last forever. That is important for all to heed. What lasts forever? Only two things last forever and that is relationships with those we love and God’s Word. The other things we often allow to squeeze these priorities out of our lives will ultimately be burned up. I want to devote the balance of my years to investing in relationships, starting with those in my own family, while relying on the words of the Bible that are the only words that breathe life into us. My friend Chuck Swindoll said it so well.. The wonderful thing about relying on God’s Book is that it gives you stability. It gives you that deep sense of purpose and meaning. No other counsel will get you through the long haul. No other truth will help you stand firm in the storms of doubt and uncertainty. No other reality will give you strength for each day and deep hope for tomorrow. No other instruction has the power to give new meaning to your life. I have many moments since Brenda’s passing where I have been seeking new meaning to my life. I am finding it through being faithful in reading scripture daily. Brenda interestingly left me a list of those things she wanted me to continue doing after her death. Continue to lead our family and grandchildren. Continue to proclaim the gospel of grace through speaking, writing and encouraging leaders. Travel strategically for ministry and pursue your passion for China and Africa. Enjoy the business of executive mentoring. Notice how they focus on things that are eternal? They are all relational and fuelled by the gospel or good news of God. Only two things last forever—and I’m committed to both. How about you? PS. Brenda’s book BUT IF NOT will be available soon and I will make it know once printing is completed. I am pleased to announce I will be speaking with my good friend Dr. Paul Pearce at a special “Adult Get Away Retreat” at Barnabas on Keats Island April 15-17. The setting is spectacular. A quiet spot on Keats Island overlooking Howe Sound with comfortable and spacious rooms, delicious meals and warm hospitality. This weekend is open to all adults—married or single. It is a spiritual retreat that includes relaxation, meeting new people and fun. This faith-focused weekend will give you rest and renew your soul. Our theme this weekend is TRANSITIONS: Exploring life changes as maturing adults and it is a particular Having just gone through, and still going through a huge transition in my life after the death of my wife Brenda the whole topic of transitioning in life is both relevant and meaningful to me. Canadians approaching retirement are now the fastest growing demographic in the country. The sharp increase can be attributed to the aging “baby boom” generation, who account for almost one-third of the nation’s population. Everyone copes with aging differently. For many the so-called “golden years” are “years of adjustments” as we deal with changes such as winding down our careers, moving, becoming a caregiver, adjusting to a fixed income and other such consequences of aging. Some changes are expected and easy to cope with. Others can shock one’s sense of stability such as an unexpected decline in health, finding meaning and purpose after a career, or the loss of a loved one. This weekend is for those who are approaching or already into the change of a new season in life (55+/-). Together we will explore how to embrace times of change and to better understand biblical teaching as we become, “mature and complete, not lacking anything” (James 1:4). There will be practical helps in learning how to face and deal with life decisions differently as well as learning from one another so we might change and adjust to find new life and growth in our spiritual journey. I cannot express how meaningful it is to talk about upcoming life transitions in advance of being thrust into the situation. I want to invite friends and friends of friends to come join with us for this relaxing yet meaningful weekend. Specifically Paul and I will be engaging you on the following topics, all in the beautiful setting of Barnabas, one of my favourite places on the planet. Personal Equity – what you bring to this time of life. Vocational – what am I going to do? Contact Barnabas directly to register or for further information. Need Assistance? Mom and I one month after her diagnosis. I had the incredible honor of caring for Mom in the last week of her life. As a nurse, it was the only thing I had to offer to her as a gift, to fulfill her wish to die at home, and it was the greatest privilege of my life. Yet, even now, it seems so small in comparison to all of the gifts she gave me in the five years I’ve been a part of her family. That last week was hard for everyone. Realizing how quickly everything had changed was a huge shock, but we were yet again blessed with extra time with Mom. Her strength still astounds us all. In those last days we all had individual time with her – time I think we will all hold onto dearly because of the real moments of connection with her. Moments we never thought we would have again when we first gathered as a family around her bed. But Mom continued to amaze us by opening her eyes, smiling and even speaking small sentences to us. The five days passed both too quickly and so slowly at the same time. Those days all blend together now. The most amazing thing I witnessed during that last week however, was the love between Carson and Brenda. Their tenderness toward one another was beautiful. How Dad would do anything for her, assisting me in caring for her in a way that no one else could. Helping me change and wash her; lifting her gently to reposition her on the bed; putting her favourite lip chap on so her lips wouldn’t dry out (even though he went too far down her lips, making mom wave him off). The way he whispered in her ear in her final moments, selflessly encouraging her to go meet her Lord, was both amazing and heartbreaking. I can only begin to imagine how hard that must have been, to let go of your life’s great love. It was so beautiful, the way he served her until her final breath. Even in those last days, Mom served Dad too, giving him gifts better than presents. Gifts like opening her eyes when we didn’t think she would again. Doing things for him that was better than an “Oh Wow”, which she gave to others when she woke up and recognized them, but not to him. The gifts she gave him were things that seemed so simple, like pulling Dad in by his shirt so he was closer to her. The way she would spend so much of her precious energy just to reach up and touch his cheek. How she would turn her head to lean in and kiss him, and then how Mom spent an entire days worth of her energy moving over to Dad’s side of the bed because, after 39 years, her side just wasn’t close enough to him anymore. She loved him so deeply. Mom served Dad by giving him the moments of confidence that allowed him to let go. Being able to witness those intimate moments meant everything to me. It was just another gift that Mom gave me, sharing the glimpses of their love with me, showing how even in the final moments, love is more than enough. I learned so much about marriage in those days, that it is about carrying each other to the finish, even if just one of you crosses the line. Theirs was, theirs is, a great love. Love is what mom emanated. It’s been more evident to me than ever since she passed. She shone in every room she entered, and she brought people into that light by loving each person. 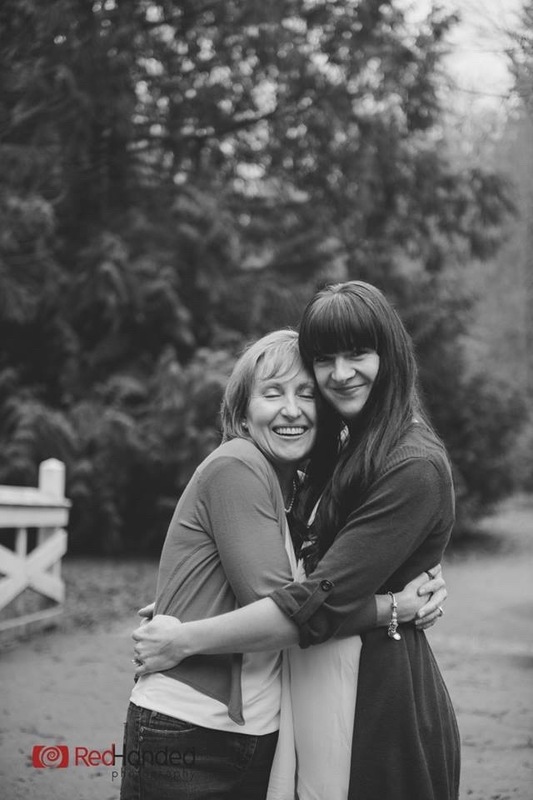 The fact that people who, to most of us, may seem insignificant in the grand scheme of our lives, cried when they heard of her passing, speaks to how Mom touched their lives. It demonstrates how important people were to her and how much love was a part of her life. I learned so much about Godly love from Mom, I learned that love cannot be confined to just a marriage or a friendship, but to it is meant to be given equally to every relationship that we enter. She has inspired and challenged me to love differently. 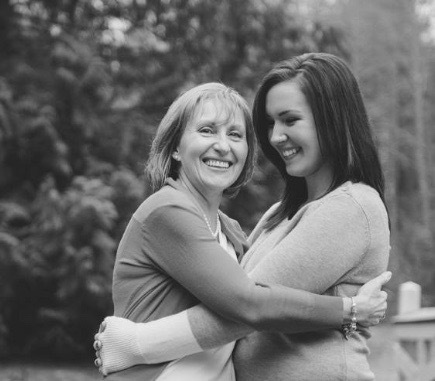 Since Mom “slipped into heaven” the days have felt so long…and the roller coaster of emotions, so overwhelming. Mom had prepared so well. She took time to plan the details of her Celebration of Life and Hope Service. There were details for the family, gifts for people she loved. She left us lists, all sorts of lists, and every day as I look through them, they make me smile. One of the first things we noticed was her “communication plan”. On this plan she had written who she wanted us to let know of her passing and memorial details. So Kirstie and I printed some pictures of Mom with her Celebration of Life details and headed out one afternoon to fulfill her wish. As well as the neighbours around Mom and Dad’s house, the list started with Porters, her favourite coffee shop. Then the dry-cleaners she went to and the Subway next door owned by a high school classmate of Jeremy’s. It seemed a bit strange doing this, but soon became very clear to us what an impact mom had on the people around her, in every area of her life. Just before we had left the house the home nurse came by to pick up supplies and had told Dad how she loved getting to know Mom and that nurses in her office had been reading her Caring Bridge and want to attend the service if they can. At the dry-cleaners, the owner started crying and hugging us, saying how sorry she was and how much she loved Mom. At Subway, the owner was brought to tears. He thanked us for coming in and letting him know, and told us that he’d be at the service without a doubt. I can’t say that the guy at our Subway would know who I am, but I am definitely inspired to live my everyday life a bit differently. Mom was the first person I went to for advice on raising my boys…she had so much wisdom to share. I will always be thankful for the times she allowed me to call in tears and how she’d help me walk through any situation with grace. She taught me so much and I pray that I can raise my boys to be Godly men as she did hers.